http://www.line-stickers.com/ – Good! 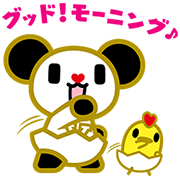 Morning Line Sticker | TV Asahiʹs Good! Morning presents the cutest stickers ever! Friend the Good! Morning official account to get this set, and check out the show for activities you can participate in just by using them. Have a Good! time with this fun set! Available till September 23, 2015.